It is easy to find fresh flowers quickly and inexpensively! Use the services of the same day flower delivery riga and in any part of Latvia. The floristic studio KROKUS offers all the desiring persons to purchase the freshest flowers at favorable prices. The best same day flower delivery can be issued on the website or by calling the operator at any time by phone +371 200 303 06. The flowers same day delivery is realized by its own courier service even on weekends and holidays. What reasons make us order the same day flower delivery in Riga? Find out why KROKUS meets the needs of customers and brings bouquets as soon as possible. Buying any product or service in the Internet we hope to receive them on the day of order. Undoubtedly, the fast processing of orders and the delivery of the customer's purchases in a short time is a significant advantage of any shop. That's why KROKUS offers its customers the same day flower delivery riga and other cities of Latvia. It should be noted that customers may have different reasons for which the fastest delivery of a bouquet is necessary. We will tell you about three most common about flowers delivery. Despite the fact that our offered compositions are made only of freshly cut flowers and can remain beautiful for 7-10 days, some customers from Latvia wish that they are delivered a bouquet in the most natural form. Often, such compositions are used to decorate interiors in ceremonial halls, for example, for a wedding ceremony. The best same day flower delivery in Riga can be offered to you only by KROKUS shop. If you are on an event or just visiting, and you want to hand a bouquet of flowers on your own behalf as soon as possible, you do not need to rush to the nearest shop. You should order an urgent the same day flower delivery to the address in Riga (Latvia) to realize your plan and to organize a pleasant and unexpected surprise for the gifted person. You can do this using the online order service of the online shop KROKUS. When making a purchase in the online shop KROKUS, indicate the desired date and the time of the delivery of the composition to receive flowers on the day of order. 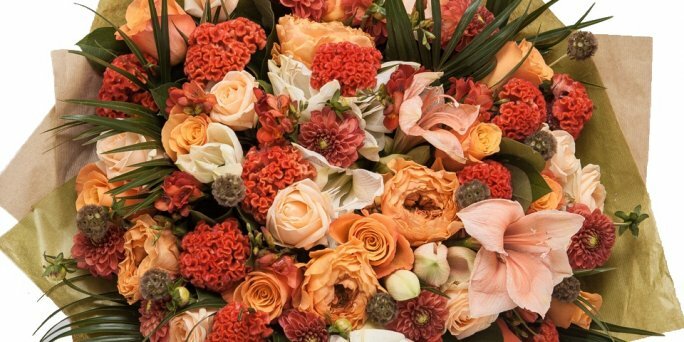 Note that only here you can use the flower delivery same day Sunday in Riga (Latvia), when most competitors refuse to deliver bouquets, referring to the day off. Use the best service of ordering and delivering flowers to any part of Riga and all over Latvia today! Go to the catalog of KROKUS compositions, choose a suitable bouquet and pay for the goods in a convenient way. If you have difficulties with making an online purchase, feel free to call us at the specified phone number for a free consultation of a specialist in choosing a composition, as well as agreeing the details of the order.